You never know who's smiling at you from across the counter. Chris Hammes works at Mugs coffee shop in downtown Fort Collins, Colorado. Most mornings when I arrive at Mugs for my daily coffee ritual, I am greeted by his warm smile and kind demeanor -- always engaging, he inquires genuinely about how I'm doing. Who knew that behind that smile -- and those kind, blue eyes -- hid the dedication and spirit of a true champion. At only 26 years of age, Chris is an ultra-marathon runner. Not ... See More only has he run several 50-mile and 100-mile races, but more than once he's crossed the finish line in first place. I met Susan Singley years ago when she worked at The Food Coop here in Fort Collins. Upon first meeting Susan, her easy laugh, infectious smile, and warm spirit immediately engage you. A few years ago, Susan decided to pursue her dreams and move to San Luis Obispo, California, where she was surrounded by the dual beauty of the mountains and the ocean. Life was an adventure, but who knew how the winds of fate would take her to her greatest adventure yet. 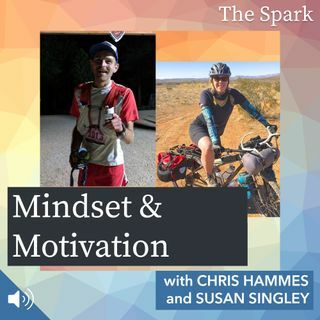 The Spark is supported by its listeners, and by Audible.com. With over 180,000 titles to choose from, Audible.com allows you to listen to an immense library of books for every taste on your iPhone, Android, Kindle, tablet, or computer, including titles that have been featured on this program such as Molly's Game by Molly Bloom and The Abundance Effect by Justin Morales.